We bought the Buick for just $20 and I got another one from Dapto and with the two of them my brother and I got this one going. We registered it and used it for surfing for two years but that was back in 1967. It traveled the coast from Victoria to Queensland for two years, transporting seven of us just following the surf. 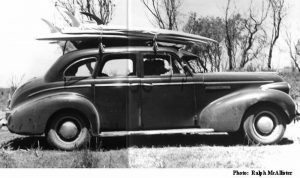 The car was enormous inside two guys used to sit on the back floor backs against the front seat, quite comfortable on trips It was a case of filling up the oil and checking the petrol and the reliable old Buick cruised along. But on many a morning my mother would have to help push it so I could get it started to go to work. I well remember the day I purchased it and drove it home flat out as it hadn’t been driven apparently for ages. I used to work for a car yard and I borrowed their trade plates to run it home as it was out of registration. When I drove into the garden the brakes failed and I went through the fence. No damage to the car but the fence needed some new pailings.